Chennai: SS Sarvanan, the AIADMK legislator who unleased a political storm with his cash-for-trust vote claims on Tamil Nadu Chief Minister E Palaniswami, today denied that he has said any such thing. Over the weekend, local television channels aired footage of a sting operation that purportedly showed him making claims of pay-offs to ruling party legislators ahead of the trust vote. The Chief Minister had won the trust vote in February by a huge margin. As the Chief Minister promised an investigation into the allegations, Mr Sarvanan claimed the video was doctored and that he is consulting lawyers for legal action. "It is me shown in the video. The voice has been doctored," he said. Mr Saravanan had been the first to escape from the resort, where legislators had been kept sequestered by the VK Sasikala camp ahead of the trust vote. Local television channel Moon TV said it recorded Mr Sarvanan on a hidden camera saying up to Rs 6 crore could have been paid to AIADMK legislators by the Sasikala camp to win the trust vote in February. "When we boarded the bus, we were told we'd be given 2 crores; before we reached Kovathoor resort, it became 4 crore. Around the airport area, it was 2 crore and as we crossed the Raj Bhavan, it became 4 crore and later, once we reached (the resort) they said 6 crore," he is heard saying in the video. "The next day, they said no cash, only gold would be given." The legislator from Madurai South said he was "happy" and even called home "and said all our problems would be over". But the party leaders, he had added, "did not commit, none called us directly on this". In February, AIADMK chief Ms Sasikala had kept more than a hundred legislators of her party at a resort outside Chennai for a week as she was facing a revolt from O Panneerselvam, whom she was attempting to replace as the Chief Minister. But a Supreme Court verdict that found her guilty in a disproportionate assets case poured cold water on her plans. Before she went to jail, Ms Sasikala made her proxy, E Palaniswami, the Chief Minister. He won the trust vote with the support of 122 legislators, just five more than a simple majority in the 234-member assembly. 12 others had voted against the trust vote. 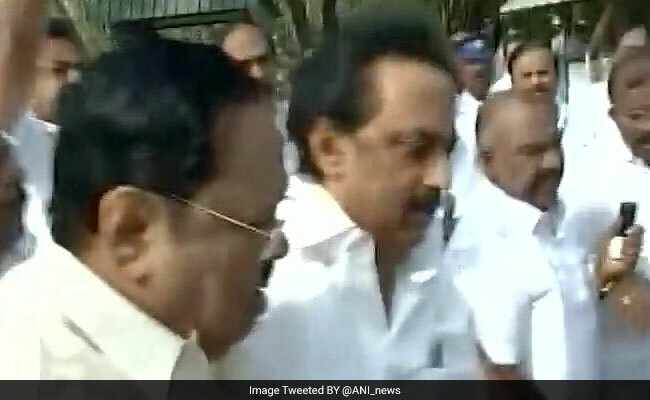 Opposition leader and DMK's working president MK Stalin, who has challenged the trust vote, asked the Madras High Court for a CBI probe into the matter.